Botticelli’s painting, created around 1480 or 1481, takes its title from the book that is open before Christ and Mary. This type of devotional manuscript, known as a Book of Hours of the Blessed Virgin, describes both Mary’s piety before God and her sorrow at the suffering her son. This highlights two sides of Mary’s identity. In The Paradiso, Dante calls Mary “Virgin mother, daughter of your Son, humbler and higher than all other creatures.” This describes Mary as a sacred paradox. She is a mortal woman. She is the mother of God. The devotion to Mary, evidenced in Dante’s writing and Botticelli’s painting, acknowledges her as the conduit of grace through whom Christ entered the world. As Queen of Heaven, Mary has a revered place in paradise, a position from which she can intercede on behalf of the faithful. Botticelli’s Mary is a paragon of beauty. She has the tenderness of a mother and the decorum of royalty. Mary’s countenance is both graceful and sorrowful. As a mother the Virgin mourns Christ’s future suffering. And yet, she knows that his death and resurrection are her salvation. Botticelli’s depiction of Christ is, necessarily, equally complex. The infant reaches for his mother with an expression that seems to be responding to Mary. But is Christ looking to Mary for comfort, as a child would his mother, or is he reaching out to comfort her? Christ is both Mary’s son and savior. The focal point of Botticelli’s painting is the reciprocal gaze between Christ and Mary. The structure of his composition visualizes the love between them, making it present in the moment of the viewer’s faith. Botticelli’s artistic vocabulary draws the viewer into their emotional and spiritual bond. This capacity to envision sacred intimacy made Botticelli one of the most distinguished painters of devotional subjects in 15th-century Florence and continues to draw viewers to his art. The Virgin with Christ on her lap was one of the most popular subjects of 15th-century Italian art and a recurring motif in Botticelli’s art. He transformed this well-known subject from a moment of maternal-infant affection into an image of spiritual fulfillment. The pictorial unity of Botticelli’s composition visualizes the sacred harmony of his subject. The pure and complete love between Christ and Mary evokes a potential relationship between God and humanity. As a work of devotional painting, Sandro Botticelli’s Madonna of the Book makes this blessing more accessible to the viewer. 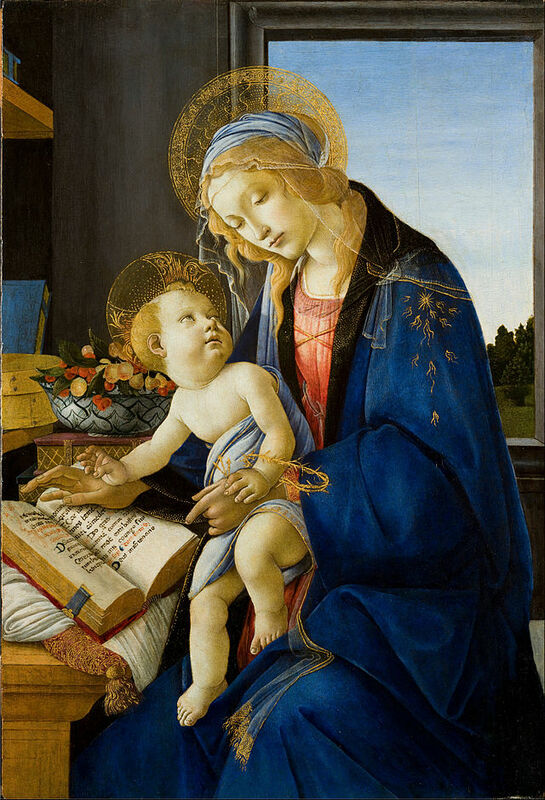 Sandro Botticelli: Madonna of the Book, c. 1480, tempera on panel, 58 cm × 39.5 cm, in Poldi Pezzoli Museum in Milan, Italy. Sandro Botticelli (1445-1510) was an Italian painter and draughtsman. During his lifetime he was one of the most acclaimed painters in Italy, being summoned to take part in the decoration of the Sistine Chapel in Rome and earning the patronage of the leading families of Florence, including the Medici. James Romaine is Associate Professor of art history at Nyack College, New York City, USA. He is the president and co-founder of the Association of Scholars of Christianity in the History of Art (ASCHA). Dr. Romaine’s video essays on Sandro Botticelli can be viewed on YouTube at Seeing Art History, see https://www.youtube.com/channel/UCGInLlFDxg-GgCEUQkjKwng.